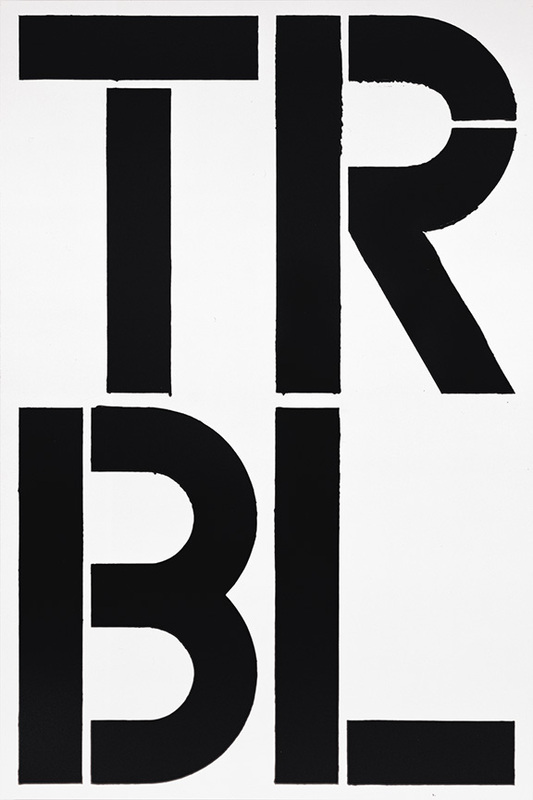 “Trouble” (1989) by Christopher Wool, courtesy of the Guggenheim Museum. We tend to think of words as the exclusive raw material of writers. But this has been a season of sparkling reminders that artists from many camps — cubism, conceptualism, minimalism, realism and pop — have used words to fashion some of the most inspired art of the past century. The show’s over? But it just began! Welcome to Wool’s world, a place that offers doubt instead of certainty, a world full of disappointment and misfits and unease. A note on the wall beside “The Show Is Over” tells us that the words are from a 1918 essay by the philosopher Vasily Rozanov, allegorizing the upheaval of the Russian Revolution. The Situationist writer Raoul Vaneigem later promoted their sentiment as the ideal description of nihilism. This layering of meanings is reflected in the painting itself, a palimpsest, with painted-over letters visible behind the foreground letters. Something you don’t appreciate from a reproduction is just how painterly the picture is, how rigorously the surface is worked, how the hard edges of the letters actually wobble and the white background paint sometimes bleeds onto them. It’s ravishing, visually and intellectually, a deft dovetailing of medium and message. 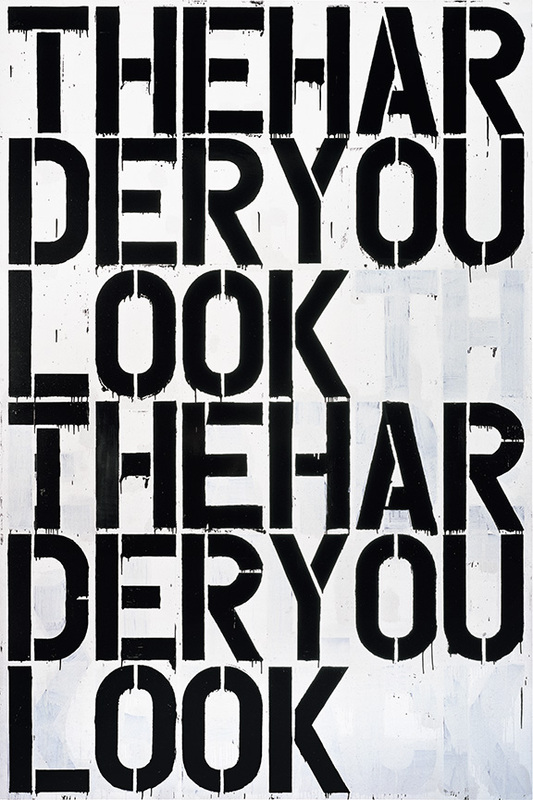 “Untitled” (2000) by Christopher Wool, courtesy of the Guggenheim Museum. Finally, at the top of the rotunda, is the painting that ties it all together. It reads, THE HARDER YOU LOOK THE HARDER YOU LOOK. It makes plain that Wool refuses to offer tidy satisfactions. Or does he? Again you see the ghosts of painted-over letters behind the foreground words, and you learn that originally the painting read THE HARDER YOU LOOK THE HARDER IT LOOKS BACK. The sentiment is from the Austrian writer Karl Kraus, who wrote, “The closer you look at a word, the greater the distance from which it looks back.” Wool apparently agreed with Kraus, then changed his mind and chose to disagree. Rarely have doubt and disagreeableness been so lovely and so rewarding. Courtesy the artist and Casey Kaplan, New York. This is a story about the human cost of capitalism’s brute efficiency. As someone who grew up in Detroit and watched the relentless shuttering of auto plants send the city into its current state of financial and physical ruin, I think I can say that Gillick’s message is an important one for our times. It’s also quietly beautiful. And quiet beauty is hard to come by nowadays in Chelsea’s big-box, high-dollar galleries. Even quieter is a series of word paintings by Scott Reeder at the Lisa Cooley gallery on the Lower East Side. Ranked along one wall, his bright paintings pair two four-letter words, one atop the other, to give us this Detroit-based artist’s view of a world full of fakery, menace, and light fun. (He uses pasta to make his pictures.) Some samples: FAKE RICH, IFFY IDOL, MOOT MEME, JUST INFO, COPS KISS. On the gallery’s back wall is a large painting (96 by 108 inches) that appears to be a starry sky at night. 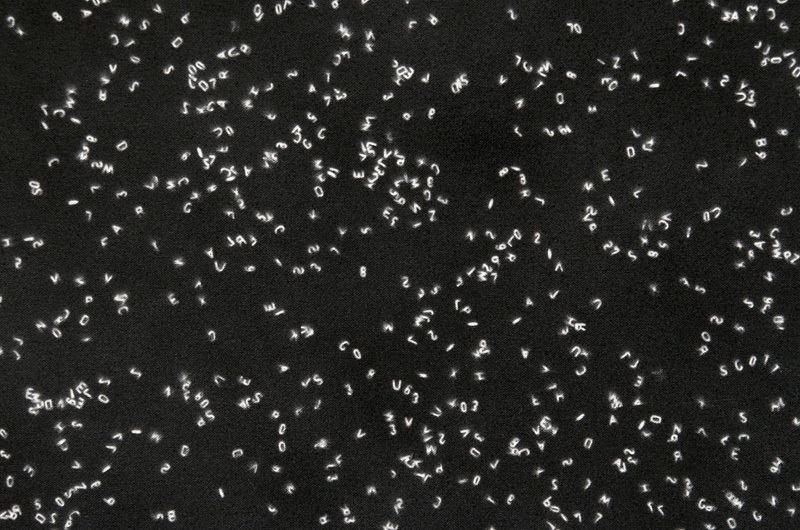 As you step closer, though, you realize the stars are actually tiny white letters and numerals. It’s a bewitching expression of the infinite possibilities of language. The use of words in art is nothing new, of course. A century ago cubists such as Picasso and Braque inserted snippets of newspaper advertisements into their fragmented compositions. Magritte combined images and words in his famous 1928 painting of a pipe with the message This is not a pipe. More recently, Barbara Kruger followed his lead in works that combine photographs with wry verbal messages, such as her picture of a hand pressing the point of a safety pin to a fingertip on another person’s hand, overlaid by the words Thinking of You. 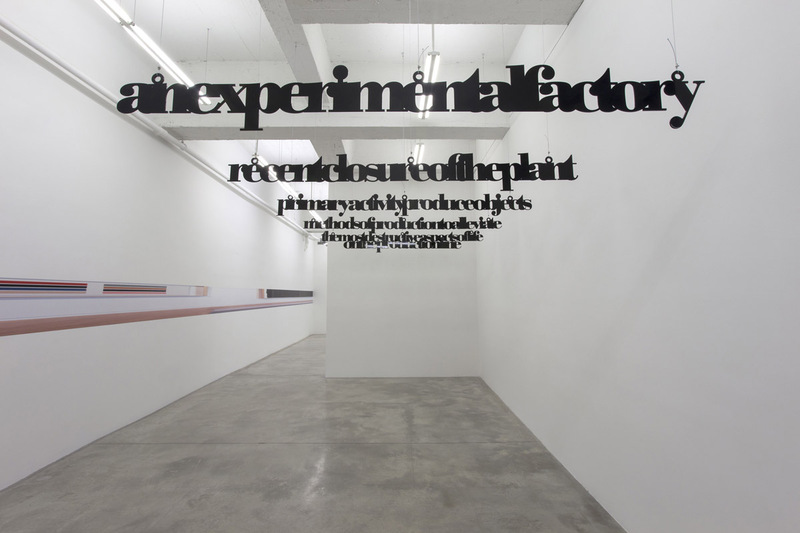 Jenny Holzer, Bruce Nauman, Lawrence Weiner, John Baldessari, Jasper Johns, and many other artists have used words, even whole alphabets, in their work. Ed Ruscha has made paintings out of isolated monosyllabic words, including “Oof,” “Honk,” “Boss,” “Noise,” and “Smash,” as well as the Hollywood sign and corporate logos. Ruscha once said, “I like the idea of a word becoming a picture, almost leaving its body, then coming back and becoming a word again.” With Ruscha’s one-word paintings, there’s no need to look harder. One look says it all, which is part of the visceral fun. It represented for me an accommodation, a sort of peaceable kingdom. The pumps are on raised platforms because this land, which is at sea level, floods during a hurricane. Cows, horses and wading birds share this 1,200-acre field with the pumps, and when strong winds blow in from the north after the passage of a cold front, the sediments that are pumped up with the oil and natural gas and which collect in the bottoms of ditches, are stirred up so the ditch water looks red. The perspective down the center of this painting is the raised embankment of an old railroad bed. The cows like to congregate and lie down to rest on this long-infertile ground because it dries off quickly after a rain; and so they dung it up intensively too. So, it is gradually beginning to regain fertility and support a sparse cover of weeds which spread in by runners from either side of the embankment. Here the tenses of a landscape imagery which represents what is lost or threatened are reversed: we see decaying industrialization being replaced or reclaimed by the progress of nature. Those weeds interest me more than ancient redwoods; they are the vanguard of nature’s forces as she wages her war back on us; perhaps I should say, here nature re-embraces us, her prodigal sons and daughters. These weeds give the idea of nature not as a state we’ve lost but as a process with a future. Proust had his madeleine and Rockwell had his lamppost. He saw it clearly before him, a lamppost on a quiet street. Then he imagined what could happen to it. A boy climbs up it, a boy falls off it; someone chases the boy around it. He did this all the time, envisioning the lamppost and waiting for the scene to emerge, a boy or two, a certain facial expression, a story. The wordiest of all the current shows is “Robert Indiana: Beyond LOVE,” now at the Whitney Museum of American Art. This career retrospective, as its title implies, sets out to make the case that Indiana’s body of work is richer and far more diverse than his best known and most iconic image, the two- and three-dimensional renderings of the word LOVE, with its L and skewed O stacked on top of its V and E, all the letters tightly interlocked, multi-hued, ever-changing, simple and yet endlessly complex, which is to say Indiana has made the physical word into something much like the emotion itself. The show is a knockout. We see Indiana grappling with that woolly beast, The American Dream, restlessly probing its promise, glitter and horror. The result is a coast-to-coast gabfest, a cacophony of words, including the names of “American Sweethearts” (May, Lil, Ida, Flo, Ivy, Eva), place names (Chicago, Indiana, the deep South), signage (“Bar,” “South Ferry,” “The American Gas Works”) and political slogans (“Just as in the anatomy of man every nation must have its hind part”). It’s easy to believe Indiana’s claim that he was influenced by the writings of Melville, Walt Whitman, and William Carlos Williams. I’m guessing he’s a Kerouac man too. But of course it’s your call. 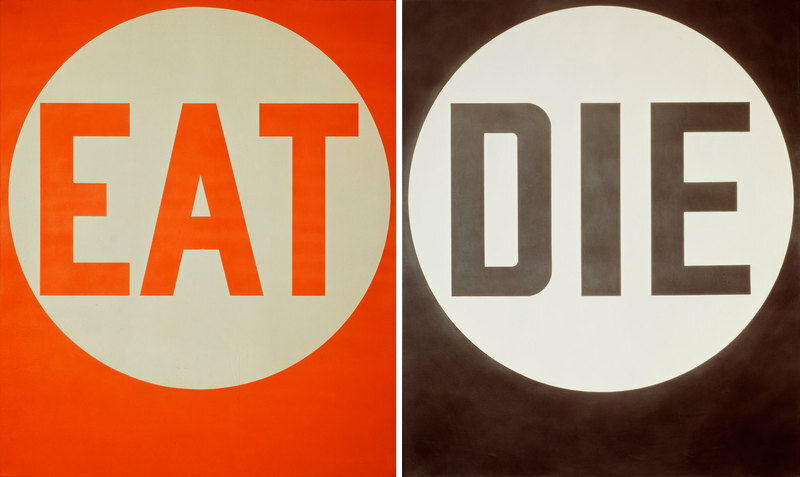 You may read “EAT/DIE” as something altogether different, neither as signs for an existential greasy spoon nor as clever shorthand for the futility and absence of meaning in human life. That’s the maddening magic of words, and that’s why artists continue to be drawn to them: words are slippery, they refuse to be fixed, they tell stories that are open to infinite readings. And so they will always keep us coming back to art and to literature for more. It is no wonder that the French feminist critic, poet, and playwright Hélène Cixous embraced Lispector and quickly incorporated the Brazilian’s oeuvre into her own lectures and writings, as early as 1979 with her text “To Live the Orange,” a meditation on feminine writing including a lyrical depiction of her first encounter with Lispector’s work dated October 12, 1978, nearly one year after the publication of The Hour of the Star and the author’s untimely death at 56. Nor is it a surprise that the Brazilian filmmaker Suzana Amaral, who had her ninth child in film school and went on to earn a masters at New York University where she enrolled in 1976 thanks to a grant and was in the same class as Jim Jarmusch, made the film version of The Hour of the Star, a project begun in graduate school that was selected as Brazil’s official entry for the best foreign-language film Academy Award in 1987. For these and more reasons I will enumerate below, the new translation of Lispector’s story of the poor girl from northeastern Brazil named Macabéa and the writer Rodrigo S.M. who attempts to tell her tale, now in Benjamin Moser’s urgent, American English prose, is a boon to readers everywhere. Lispector’s final novel, her most accessible (not a word typically associated with this writer), her most concretely grounded in a specific place, Rio de Janeiro, and time, the present, is a masterwork of interrogation: the author (indicated as Clarice Lispector herself in the “Author’s Dedication”), the narrator (the self-reflexive Rodrigo S.M., whose desire to tell Macabéa’s story is ever-interrupted by his own), the protagonist (Macabéa, the poor girl transplanted to Rio de Janeiro to eke out a pitiful living as a typist who doesn’t know how to spell and who loves to eat hotdogs, or more often dreams of them), and the reader (you!) are interrogated by a 12-tone narrative that bangs along and promises no tidy conclusion. Pontiero’s translation first appeared in the United Kingdom with Carcarnet Press and was later published in North America, simultaneously in the United States with New Directions and in Canada with Penguin Books Canada Limited, in 1992. These geographical details are of interest because Lispector’s family, originally from the Ukraine, moved to “America,” choosing between the US and Brazil, when she was two months old. This is how the family ended up in northeast Brazil and this is why Lispector became a Brazilian writer, an innovator of Brazilian Portuguese prose, though she could have become instead an American writer, one who would have injected American English with renewed forces that we can glimpse through her works in translation. Lispector herself was aware of, even perplexed by, chance’s sleight of hand. She wrote the following in one of her weekly newspaper columns published between 1967 and 1973 in the Jornal do Brasil: “What will never be elucidated is my destiny. If my family had opted for the United States, would I have become a writer? In English, naturally, if I had been. I would have probably married an American and I would have American children. And my life would be completely different. What would I write about? What would I love? What party would I belong to? What kinds of friends would I have? It’s a mystery” (the translation here is mine). Though Lispector first questions if she would have become a writer in the United States, she then provides the answer with another question. What, indeed, would she have written about in her Lispector-inflected American English? To elucidate my point that Moser’s translation is both more accurate (in terms of the literal correspondence between a word in Portuguese and its paired word in English) and more effective as a narrative than the Pontiero version, I turn now to the 12 other titles of The Hour of the Star. The beauty of this exercise is that that 2011 edition includes a facsimile of Lispector’s manuscript page with the 13 total titles in the original Portuguese (a number that bears significance for Lispector as unveiled by Moser in Why This World: A Biography of Clarice Lispector published in 2009 by Oxford University Press to great acclaim). In this way we can conduct a comparative analysis of the three texts, Moser’s, Pontiero’s, and Lispector’s original, with a small and meaningful sample of words. I have grouped the titles into three categories: 1) identical translations; 2) differing translations; 3) translations where Moser corrects or supersedes Pontiero. The first title in the original is “A Culpa É Minha” and though I find Moser’s version more compelling because it’s idiomatic, I appreciate Pontiero’s decision to keep the original’s word order, and thus keep the emphasis on “culpa” translated effectively by Pontiero as “blame.” The second title is “Ela Que Se Arrange,” an idiomatic expression in Brazilian Portuguese. The verb “arranjar” means to organize, pull together, do, get, achieve, or figure out. It can be used in all kinds of cases, from doing one’s hair to finding a boyfriend to getting out of a jam. Pontiero’s translation suggests a difficult situation where the protagonist is clearly out of her depth by using the word “fend” while Moser leaves the situation, the “it” she must deal with, a bit more neutral. I might have gone with something like “Let Her Figure It Out.” The third title is “Eu Não Posso Fazer Nada,” a double negative in Portuguese, which is grammatically correct and literally means “I Can’t Do Nothing.” Moser chooses to emphasize the lack of agency in “I can’t” while Pontiero sticks to the literal translation of “nada” or “nothing.” I go with Moser here, though I see Pontiero’s point. The fourth pairing is an example of different choices made, correctly, by both translators. The “record” versus “account” of preceding “events” versus “facts” offers two ways of contrasting truth and point of view. In Pontiero’s translation, the word “record” indicates an official compilation of truths set against his choice of “events” as occurrences that can be told from varying points of view, i.e. “A Record of Preceding Events.” Moser’s choice of the word “account” points to a version told from a specific perspective, while his use of the word “facts” correlates to uncontestable truths, i.e. “Account of the Preceding Facts.” In this way both translators strike a juxtaposed balance between truth and narrative, a theme Lispector engages throughout The Hour of the Star. The first two examples hinge on the word “protest” versus “scream.” The original Portuguese is “gritar,” which literally means “to scream.” I am not sure why Pontiero uses “protest.” It is simply not correct and it misleads the reader into thinking about a more complex, or perhaps less complex, state than what Lispector indicates in the original. A scream is a straightforward action one does with one’s mouth and throat. A scream can come for many reasons: fear, joy, anger, sadness, all of the above, and more. A scream is a physical act as well as a sound. The protagonist of The Hour of the Star does not know how to scream under any circumstance, while the narrator Rodrigo S.M. tells the reader early on that he will scream: “…it’s my obligation to tell about this one girl out of the thousands like her. And my duty, however artlessly, to reveal her life. / Because there’s the right to scream. / So I scream.” The contrast between Rodrigo S.M.’s scream and Macabéa’s silence is what Lispector wants us to experience and digest. The last two cases are examples of Moser superseding Pontiero’s translation. “Through” simply works better as the necessary preposition than “by” for the title “Discreet Exit By/Through the Back Door.” As for “A Tearful Tale” versus “Cheap Tearjerker,” both indicate the maudlin valence of the title. But, Moser’s choice is more specific and culturally grounded, which is a better fit with the original: “História Lacrimogênica de Cordel.” In Brazil the “histórias de cordel” are a staple of northeastern popular culture. They are self-published pamphlets or chapbooks written in rhymed verse by local poets who recite to passersby in order to entice them to buy a copy, as well as travel between towns to spread their tales of fiction — namely love, woe, adventure, and religious themes — as well as popular versions of current events. wealth, plus a brand-new pleasure. and retreating, always retreating, behind it. The vampire of our cultural moment has become a "vegetarian" of sorts, a Whole Foods shopper--an individual who prefers humanely raised, sustainably farmed food. From the shimmering pâleur of the vampire radiates something new and hardly otherworldly: an aura of white liberal guilt. But maybe it's only skin deep? This was so much fun to read, and seems to tap into some very different neural pathways – thank you! Brought back a long-forgotten memory of being sent to the Assistant Principal during first grade for refusing to stand down from my position on the meaning of the word “I” (Think it was part of a lesson on “I walk the dog.” “I drive my cart” “I feed my dolly” etc.). I insisted that there could be no such word, because it was too simple. I thought the letter “I” was a large structure (maybe a wooden block? a stone tower?) and that there must have been something inside it, which I deduced was a large pile of “eyes.” This made perfect sense to me, given we had learned the word “eye” the week before. Since we were great big, grown up children now, and had been studying the three-letter words, rat, cat, hat, I thought they were “having us on” with such a ridiculously simple one-letter word!